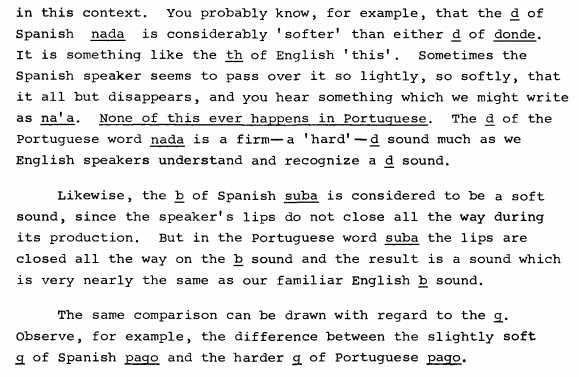 Page F30: Is Spanish or Portuguese easier for English speakers to pronounce? Is Spanish or Portuguese easier for English speakers to pronounce? This post is actually an open question that hopefully others can answer. The general consensus is that Spanish is easier to pronounce than Portuguese, and this is certainly true in most cases, but the ways in which Portuguese differs from Spanish often mirror the speech habits of English speakers. A lazy schwa-like a pronunciation at the end of a word? English speakers are used to that. Same for pronouncing an s in between vowels as z. Having an open and closed version of both e and o is admittedly harder, so no points for Portuguese there. 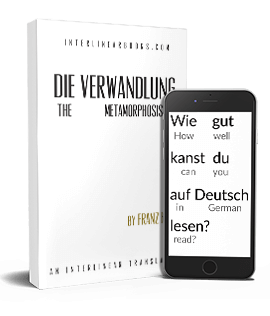 In many cases the diphthong-less word looks much friendlier and resembles a word in English, like fortitude (not fuertitude), cordial (not cuerdial), portal (not puertal), innovation (not innuevation), and school (not schuel). The same occurs with h words that are f in Portuguese: hijo vs. filho, hoja vs. folha (think foliage). 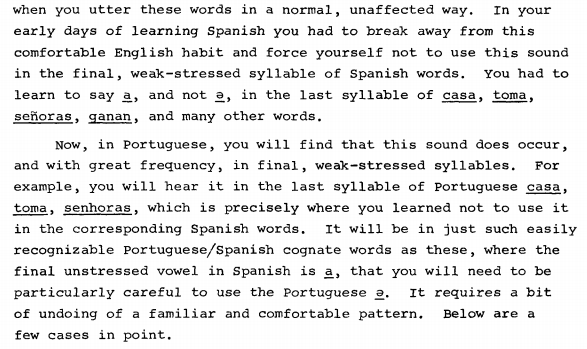 Consonants: the Spanish to Portuguese book is especially interesting here. 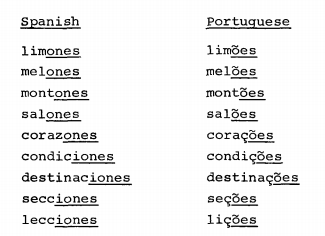 Note how many of the Portuguese consonant sounds are exactly like those English speakers are used to, instead of the softer d, b, g, and v sounds in Spanish. r sound: the Spanish r is usually a trill or a flap, in Portuguese it more resembles the French r. Which is harder is tough to say, but I find an r after an l to be much easier to say when it's guttural. Alrededor is one example of this. j sound: pronouncing j like the French j instead of /x/ or /h/ is much more natural to an English speaker. ll vs. ch: ch seems a tiny bit more natural (chamar vs. llamar), though there aren't a great deal of English cognates here even with the ch so it's probably not a big deal. So those are the basic points. In short, Portuguese is more vowelly and more slurred than Spanish is, but on the other hand in many respects it's vowelly and slurry in the same ways English is. Portuguese almost seems like a language you can speak with your mouth half closed while Spanish is more clean and almost robotically precise. So, any studies to point to that could shed some light on this?